Noah’s menagerie of stuffed toys turn into real animals in a dream scene that takes the child from the bedroom to various places around the world. 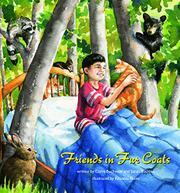 Traveling along with the bed to a North American forest, the Andes, and the Arctic, the Asian-American child meets what appear to be the real counterparts of the stuffed animals seen in the frame story, who inform the child and readers of the importance of their fur. The dialogue-only text is sometimes awkward and stilted. Birchy, the beaver, says: “I can hold my breath for fifteen minutes, not to mention having a completely waterproof and cold-proof fur suit. Chew on that...!” There is a page (including websites) for parents and other adults to aid them in speaking about the issue of the fur trade. Adults supporting this cause will want to share this book with young children. Those who do not share this opinion may have little interest in such a book, although the main text concentrates on factual information about animals used in fur coats, including the mink, the beaver, the chinchilla, the rabbit, and the fox, and not on the fur trade itself. The watercolors showing Noah surrounded by his toys and then by the animals come to life are attractive, and child readers will be interested in the fantasy of the toys becoming real—so interested, in fact, that they may be disappointed by the purpose-driven exchanges.